An extraordinary combination of high capacity - up to 1.25TB, RAID security, and fast speed, this 5-drive tower provides enhanced data protection, massive storage space, and a convenient plug & play user experience. Supporting RAID levels 0**, 1, 0+1, and JBOD, this innovative solution at a fraction of the cost for traditional RAID systems is powered by the newest industry-leading Serial ATA (SATA II) 3Gb/s technology. Simply plug it into a SATA II 3Gb/s host and enjoy a rapid sustained transfer rate of up to 187MB/s. This all-in-one storage solution comes bundled with the LaCie SATA II 3Gb/s PCI-X Card 4E. Designed for business professionals who require high-volume security and speed, this mega-storage solution is ideal for audio/video and creative professionals. Disk Interface : 5 bays x 250 GB SATA II 3.5"
Comments: *Actual available capacity varies depending upon operating environment (typically 5-10% less). **RAID 0 can only be configured using four drives. ***Windows XP will not recognize single volumes greater than 2TB. ****Sustained transfer rates can vary for a RAID product in function of several elements like: the host interface, the selected RAID configuration (storage policy), etc. 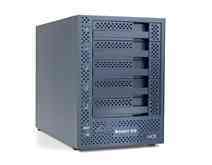 Transfer rates of up to 187MB/s can be achieved in Fast configuration (RAID 0) on current Macs. Rates as high as 160MB/s can be achieved in Fast configuration on PC. Note: PCI-Card not compatible with PCI-Express slots.